Home / Education Stories / Ngāi Tahu mothers publish children’s books. Ngāi Tahu mothers publish children’s books. 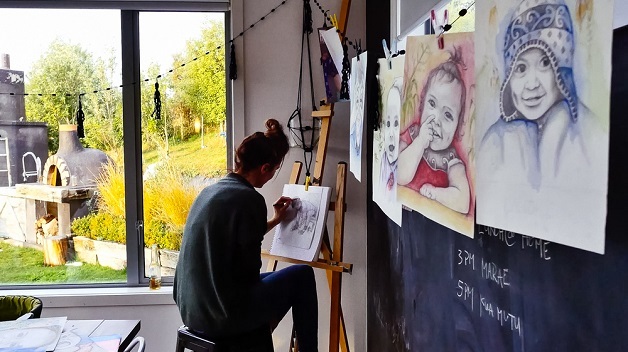 Illustrator Kirsten Parkinson at work in her studio. Two Dunedin mums have collaborated to create a series of beautiful children’s books with hand drawn images featuring both English and Te Reo Māori. Cousins Kitty Brown and Kirsten Parkinson first had the idea when they were at home with their own babies. Kirsten, who is a graduate of the Dunedin School of Art and a Dance teacher at Otago Girls’ High School, illustrated the books, which feature delightful images of local children and farm animals. The text is created by the pair of beginners, translated and then carefully edited by Fern Whitau. Kitty, takes care of administrative side of the venture, which has grown from an idea into a fully realised publishing company complete with its first set of books for sale. Reo Pēpi has a strong focus on educational resources engaging with educators directly. “We have created activities that include paper dolls, play and even a song, these go alongside our pukapuka to reinforce the learning. “We road-tested our books with several Dunedin Early Childhood Education Centres and had a great response from educators and tamariki alike,” they say. Read more about this new publishing venture in the below article in the Otago Daily Times.